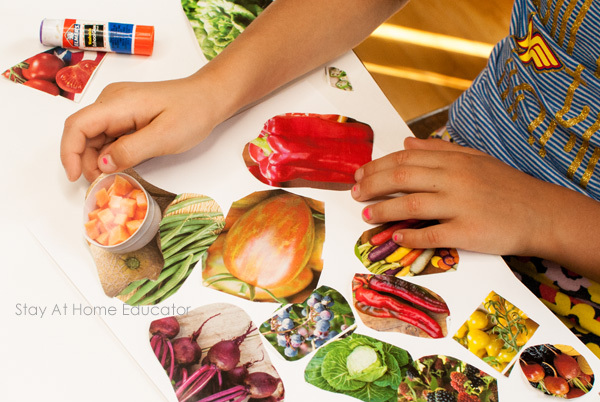 Teaching healthy eating via a food and nutrition theme is one of our favorites this time of year as it is harvest season. 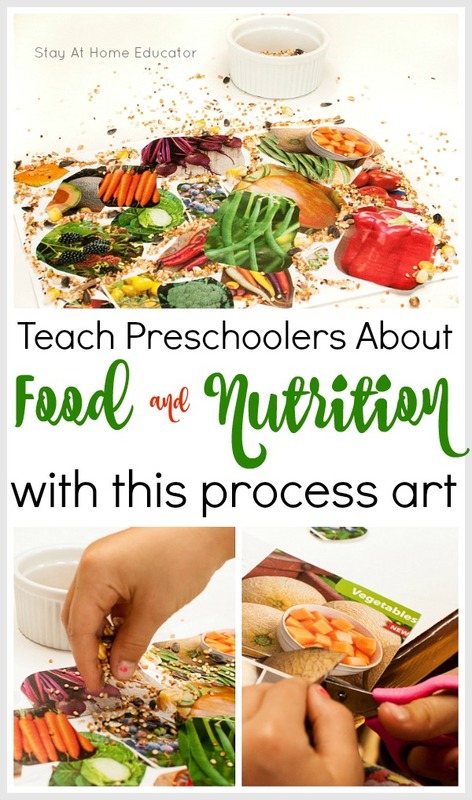 Healthy food activities are inviting and fun, and with the addition of some process art…well, it’s hard to go wrong! 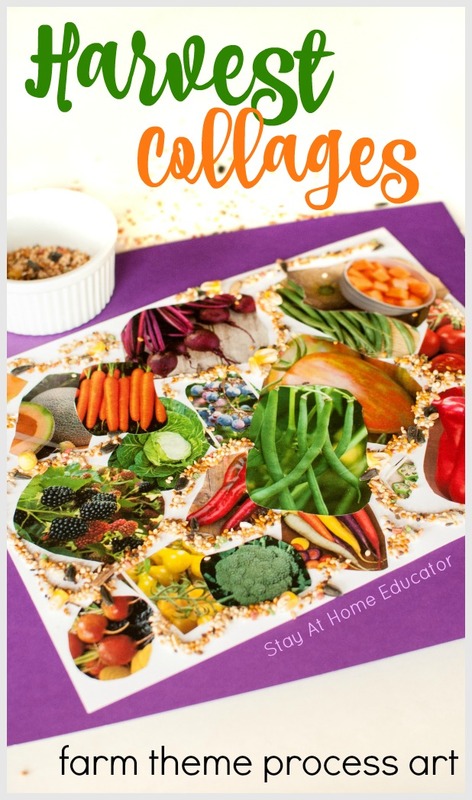 But be sure to read all the way to the end of the post for additional ways to use this single activity in teaching your food and nutrition theme! Healthy eating habits develop in early childhood, and by the time a child is in early adolescence, those eating habits are solidified. Meaning that by the time a child is a teenager they don’t realize if they are grabbing an apple or a bag of chips for an after-school snack. What they choose to eat is habitual, and it only takes 13 years to create those habits. That means that out of the 78-year average lifespan in the United States, that parents and teachers only have the first 10% of a lifetime to teach and ingrain proper diet and lifestyle. Now, I’m a bit of a self-proclaimed “health nut”, so a food and nutrition theme lays close to my heart even without the statistics. This one healthy food activity has many variations and extensions to keep children learning about healthy eating. It’s not just process art, or scissor cutting practice, or looking at healthy food. 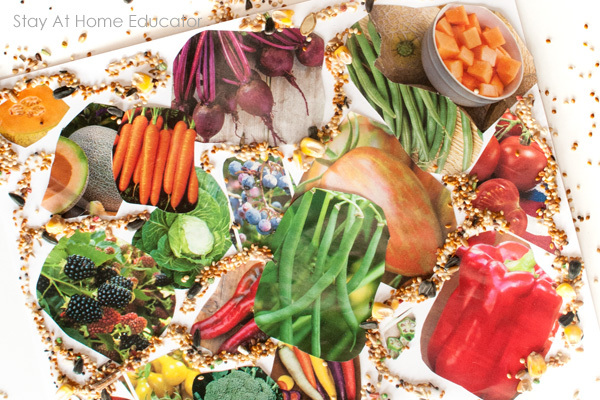 I call this a harvest collage and it has a lot of applications within a food and nutrition theme and even a farm theme. Or even gardening! Place some bird seed into a small container and set aside. 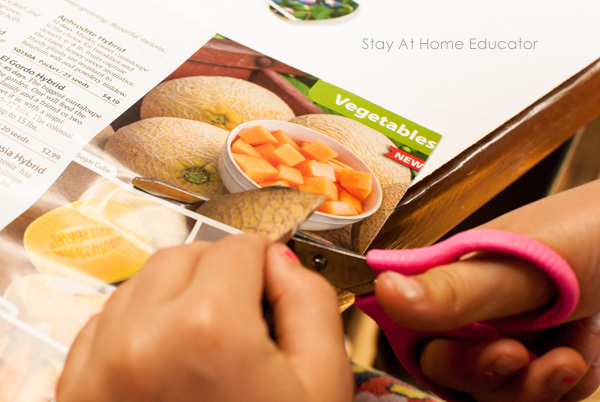 Keep cardstock and glue set aside and set out the seed catalog with a set of scissors. Invite your preschooler to do some process art with you. 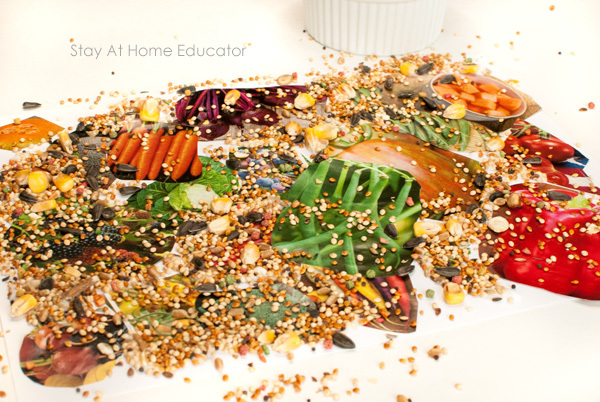 Invite your preschooler to first look through the seed catalog. He will immediately turn the pages to the food he likes and ask about unfamiliar foods. And he might say “yuck” to some vegetables. (Okra, anyone?) This is all okay. Identifying what foods he likes and dislikes is an important part of the process of developing healthy eating habits. 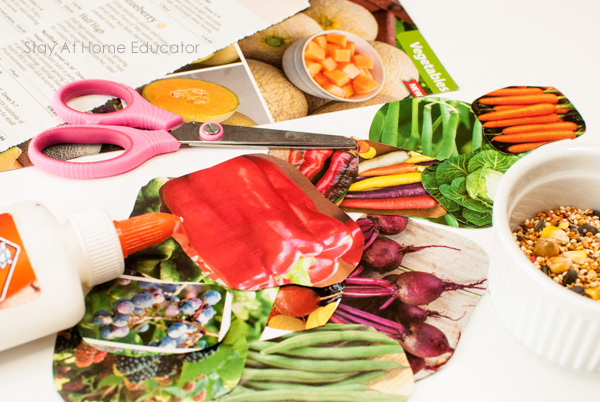 After some browsing, (and some talking) invite your preschooler to cut out some pictures of the fruits and vegetables. Don’t influence your preschooler by asking him to cut out the food he likes, just let him cut. You might be surprised by what he chooses. And this is important because some children are drawn to food because of their color, or shape, or apparent texture. A child might think he will like acorn squash because the flesh is orange like carrots. In his mind, he will like acorn squash because he likes the carrots when in reality he doesn’t actually like the squash. 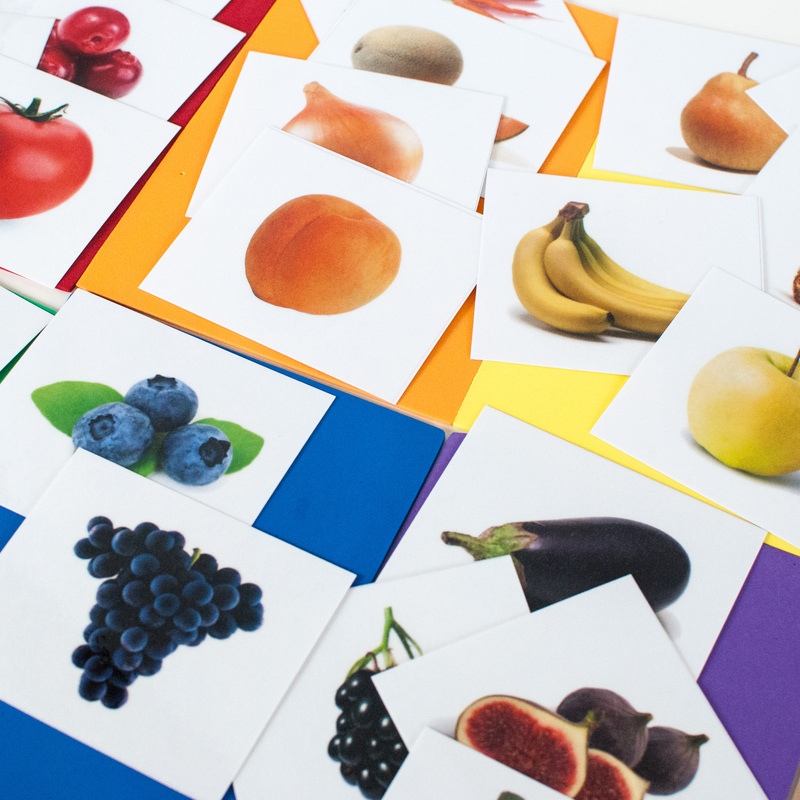 BUT, the more exposure you give a child to different (or disliked) foods, the more likely they are to try them, even if that exposure some through a simple image in a seed catalog. While your preschooler is gluing is prime time to get them talking about why they chose the foods they did. Again, children are drawn to different foods for a variety of reasons, so let them share that with you. 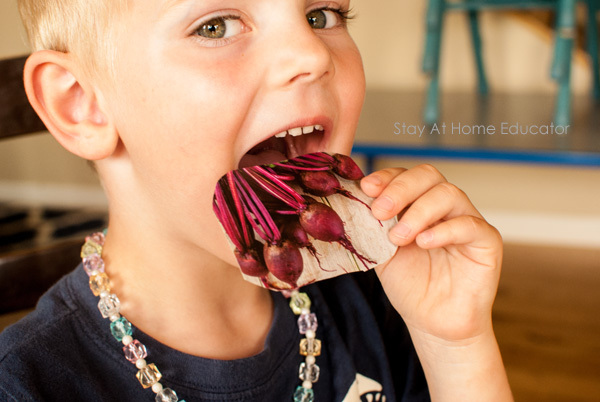 Of course…He really does eat beets in real life…I just didn’t know the real reason why. After creating our collage of fruits and vegetables, we then added some glue and bird seed. The bird seed was one of those variety packs that had a lot of different kinds of seeds in it, which is why it worked. But if you have extra seed packets from gardening, that’s even better. There’s a lot of opportunity here to talk about the different shapes and sizes of the seeds and how different plants will produce different seeds. I always spend some time talking about seeds with my preschoolers and kids because some seeds are visible in the foods we eat and we also eat some seeds. Research has shown that listening to others talk about their food helps children be more open to trying new foods, especially if it is a trusted adult. That’s why I’m emphasizing all this “talk” during this activity. It looks messier before it looks better, which is why process art activities like this one are best done on a food tray . But the finished product looks like this. Sometimes, process art activities are one and done. The learning takes place in the process, and then the pieces get sent home. But this one has several learning extensions possible, even after the process of creating it. Hang the pictures up in the home or classroom and try some of these ideas. Invite the preschoolers to view other’s collages and share their similarities and differences. Have your preschooler point to the foods in their collage that they ate recently, like for breakfast or dinner last night. 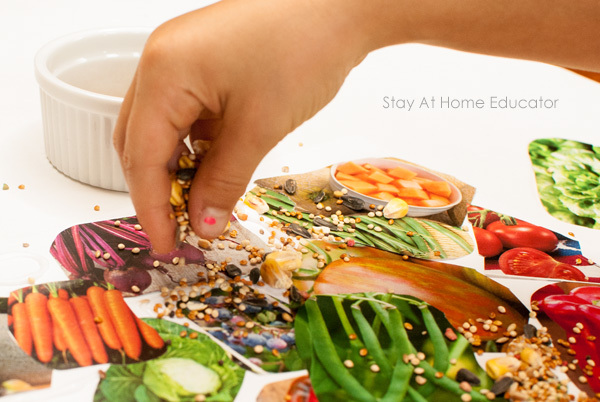 Use left over fruit and veggie cut-outs and invite your preschooler to help make a shopping list. 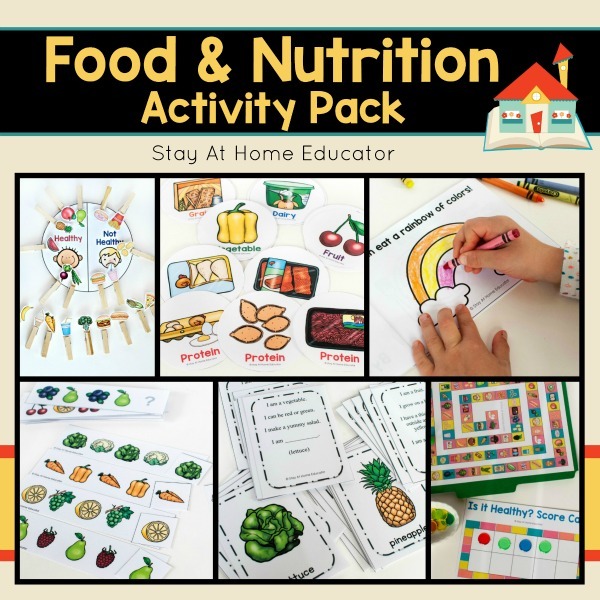 Looking for More Food & Nutrition Activities? « 5 Fall Alphabet Activities that Teach Math, too!